Vancouver is one of my favourite cities in Canada, and I love being greeted by the beautiful mountains every time I visit. 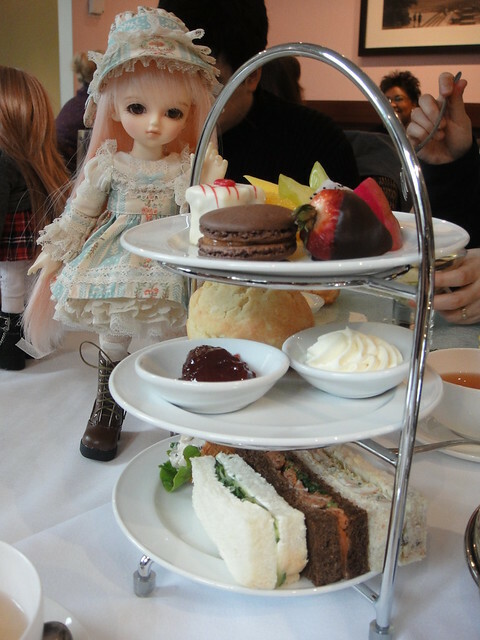 I haven’t been to Vancouver since last spring so when the opportunity arose this month I made plans with some of the Vancouver-based doll collectors to meet up! The weather was completely wonky! There was hail, snow and rain showers all within a few hours – so we stayed indoors and enjoyed a lovely brunch & afternoon tea at the Urban Tea Merchant. 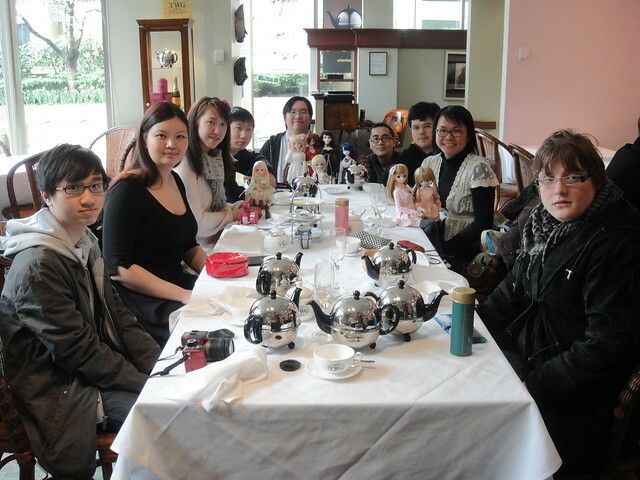 Here are most the lovely girls that came along with their owners, gathered at the head of the table! 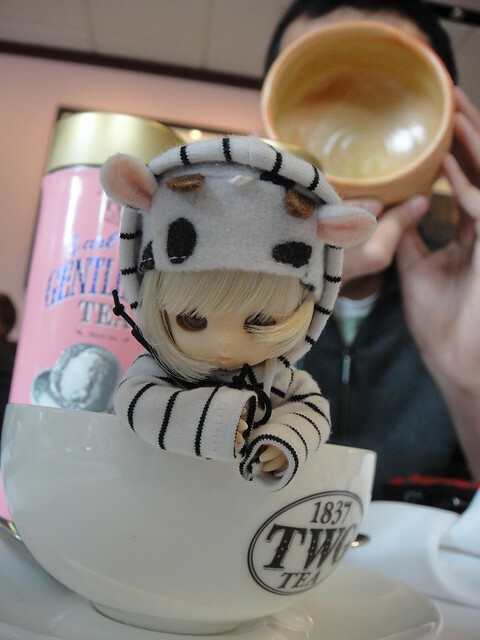 Here is BlueStarBaby’s adorable little Volks Yo-SD in a lovely outfit from Cadenza. The bonnet is so cute! I was looking forward to meeting puppy52 and sasarai since we’ve been emailing and tweeting back and forth for a while. Here is puppy52’s beautiful Aki with Gabrielle. 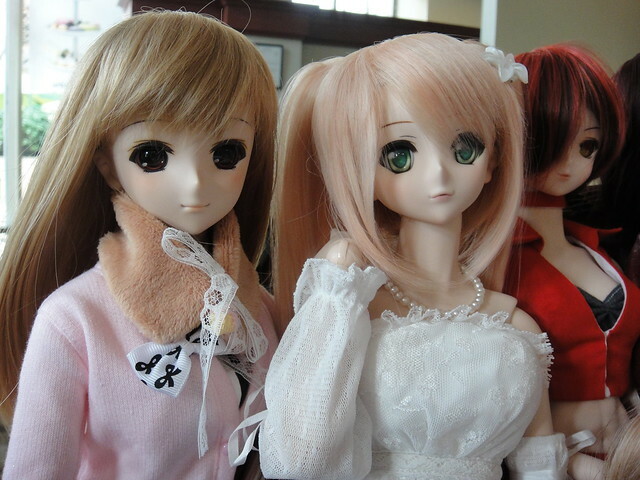 LightningSabre’s custom Meiko is on the right and she’s a really cool custom doll! Gabrielle is looking a bit more bodacious than usual because I put a L-bust on her. Sasarai had asked me before how the Akira DD looked with an L-bust so I did this “upgrade” before packing her. In the end, I think it’s more about how you dress her up, rather than the size of the bust, but I think prefer the way Gabi looks better with her S-bust. 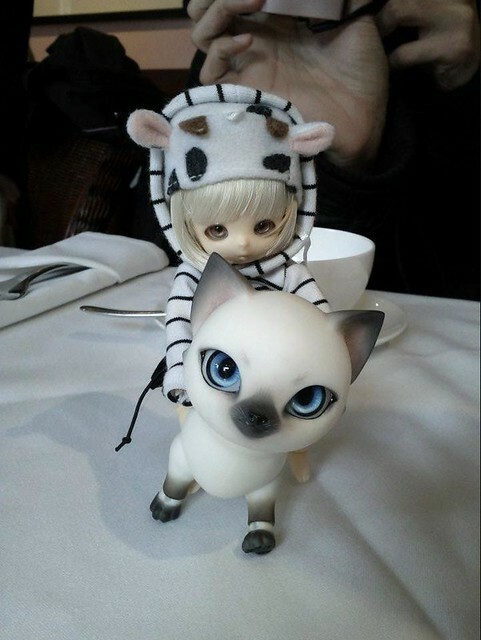 Sasarai brought his newest girl – a beautiful Luts Mia – named Ameria. She’s such a beauty and I was really tempted by her when I saw her on the Luts site last year! I really wanted to meet puppy52’s tsun-tsun Taiga because she’s so grumpy and awesome! She wasn’t too pleased about having her photo taken, but I think she secretly likes the attention – I mean her mommy made her a brand new dress just for this meetup! So spoiled! I hope she didn’t give Médée any mischievous ideas! 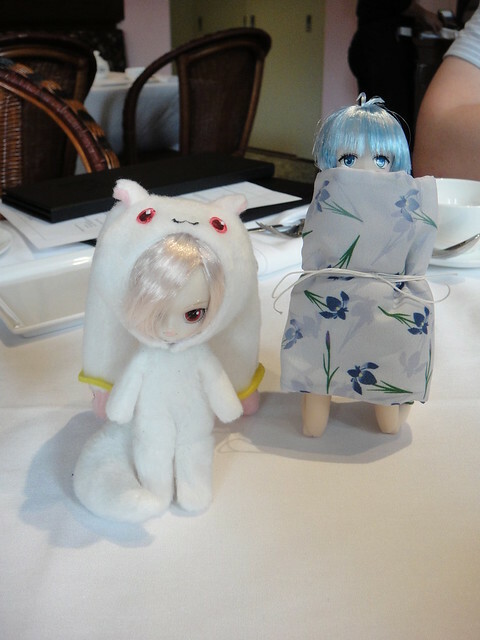 Little Suzu was getting into all kinds of mischief while we were having lunch! The tiny girls got very excited when the food came – because it was their sized! The Petit Signature Tea service is so beautiful! 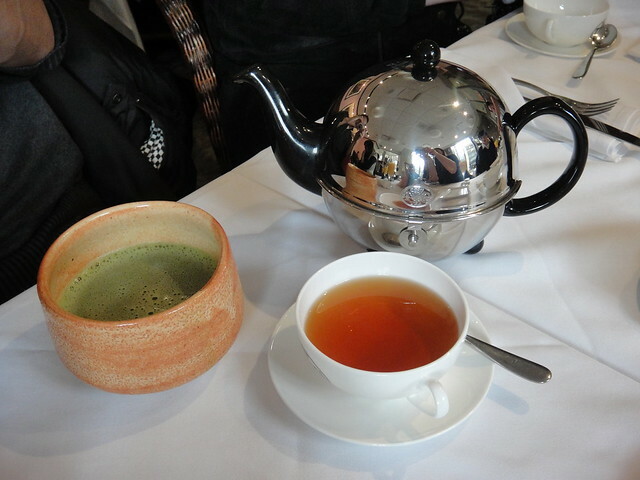 Here is their Matcha, served in this beautiful ceramic cup after being whisked, and a cup of tea called Rose Boudoir. I like that their chinaware is white so you can admire the beautiful colour of the tea. Also, each pot is individually prepared using the optimal temperature water, and then the leaves are removed so that the tea doesn’t turn bitter. I wish there were more places that did this, because it is the best way to appreciate a good tea. The rest of my photos from the meetup are in my Flickr. 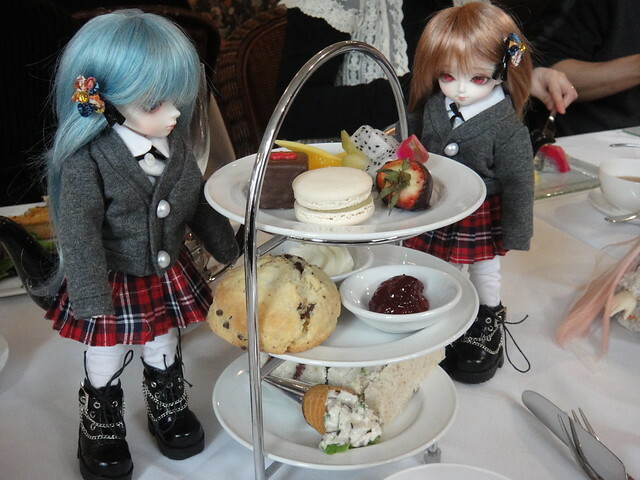 There are lots more pictures of the dolls (and the food!) that I haven’t shared here! Also, puppy52 posted some super cute pictures on her blog too. Thank you so much to bluestarbaby, Casper, theCandyMan, LightingSaber, Ken, puppy52, Sasarai, for taking the time out of your busy schedules to hang out with me on this dreary Monday, and especially to Sidney for organizing this meet! You guys definitely helped start off my week amazingly! It was lovely to meet all of you! This entry was posted in BJD Misc, Doll Meetup, Dollfie Dream, Volks Super Dollfie and tagged Dollfie Dream, meetup, Vancouver by archangeli. Bookmark the permalink. OMG, you visited Vancouver, you lucky you… So envy (>.<) I really have to make a visit out west and east sometime. 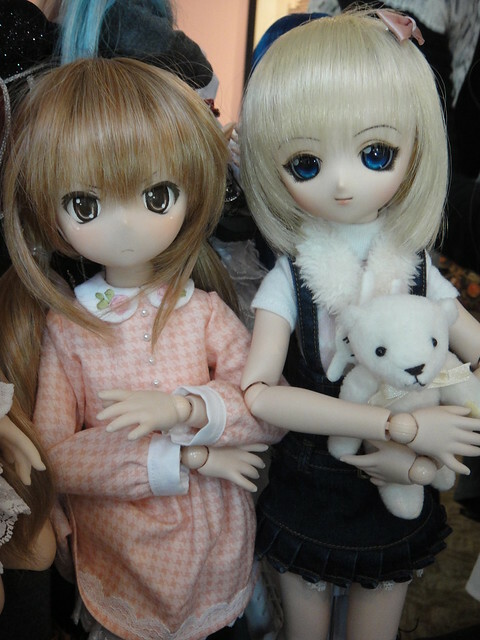 But thanks for sharing the wonderful pictures (^_^) Looked like a fun meet. The Empress in Victoria has an excellent tea service as well, but it’s $$$! I’ll have to check that place out next time I’m in the area.